Since this piece was posted, Bubba Gandy Seafood has relocated to North Star Drive, Suite 19M. Growing up in landlocked Tennessee, I’ve always viewed seafood as a treat to be enjoyed when I visit the beach. There’s nothing I could do about living seven hours away from the nearest fresh fish market. Fortunately, this is a problem that the folks at Bubba Gandy Seafood have solved for Jacksonians! Bubba Gandy Seafood is a fresh Gulf seafood market in downtown Jackson that opened its doors in February of 2015. They have a variety of wild-caught fish such as snapper, grouper, catfish, salmon, mahi mahi, and various shellfish. You can also pick up prepared gumbo, tuna dip, cream of crab soup, etoufee, crab cakes, and some hot lunch options. I have had their red beans and rice twice now, and it’s delicious! There is also a seafood cornbread dressing that I think I could eat for lunch every day. Bubba Gandy Seafood is well known for their shrimp and homemade Cajun foods. While I was there to take pictures, I picked up several of the Cajun items, including the seafood gumbo, to have for dinner that night. We heated up the gumbo and ate it over rice. The prices seem very reasonable to me for fresh seafood, but I don’t have anything to compare it to, so just take my word for it. Charles Gandy is the fourth generation in a family that has been in the seafood business since 1955. His wife Chantel was born and raised in New Orleans and many of the authentic Cajun items offered at Bubba Gandy Seafood are from her family. The Gandys were originally in the restaurant business, but after a few years decided to sell the restaurant and start a seafood market. The idea was to provide fresh seafood to cities that otherwise wouldn’t have it. In early 2014 they started their first market in Colombia, Tennessee, and have now added Jackson to the mix. 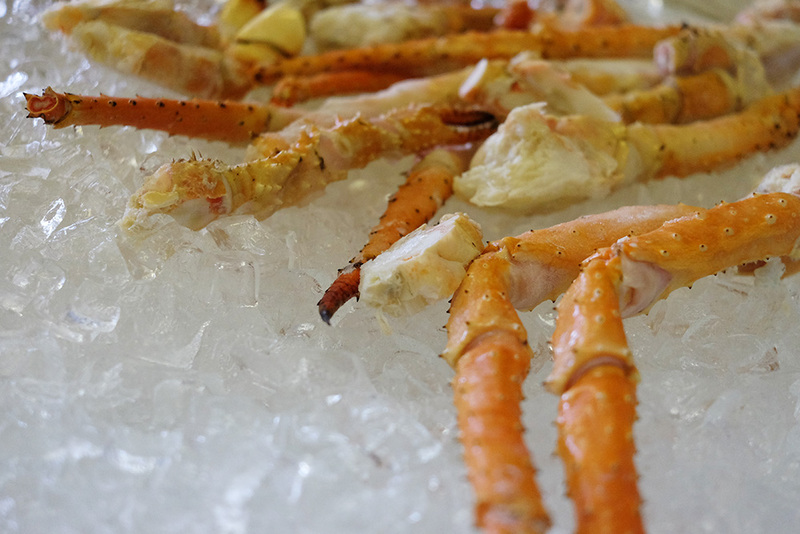 They supply both locations with fresh seafood from the Gulf throughout the week. I always like to ask small business owners what made them start their business, because I always find that there’s a lot of heart behind these places. Bubba Gandy Seafood is no exception. Chantel says, “(We) wanted to get into this business to educate people on the benefits of fresh, wild-caught seafood with no hormones, no antibiotics, no dyes, all natural and low calorie options that are now available to them. There are a lot of health issues that people face every day, and a large amount of these issue have been traced back to the food source. We want people to know the difference, and that they do have a choice because now the clean eating option is available. It’s easy to prepare and tastes wonderful!” I love that they are helping people eat better! Next time you’re planning dinner, you should definitely consider heading over the Bubba Gandy Seafood to pick up some fresh fish and maybe a delicious Cajun side dish. They have plenty of spices and sauces to use in your cooking! If you have something in mind, I recommend calling first to see what they have. Since everything is coming fresh from the Gulf, they don’t have a huge supply to restock if they have a busy day. But rest assured, within a day or two, they’ll be fully stocked once again! Bubba Gandy Seafood is located at Suite 19M on North Star Drive in Jackson. Check them out on Facebook or call 731.300.7217 for more information.